1. Search for a product that people are going gaga over on Facebook. 2. Find the same product on a drop-ship site. 3. Run some inexpensive Facebook/Instagram ads. 4. Roll in the dough. How in the world aren’t more people doing this? You won’t do it, because you have a closed mind. But that’s okay, because the less competition, the better. People are more and more getting into the Amazon.com mentality of ordering online and the convenience of having stuff delivered right to your door. I know I love opening packages addressed to me with goodies inside. Facebook loves this. How do I know? I’m doing this on a small scale and already have a Facebook account manager who calls “me.” Everyone wins, so why wouldn’t this be good? Until Trump blocks imports from China, we are good to go. 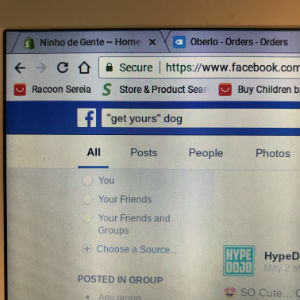 Go to Facebook and find your passion – dogs, cats, beer, hats, t-shirts… and type in “gets yours” and that keyword (dogs, cats, beer or whatever word). Here you see I’ve used the dog word in Facebook. But you can use whatever product in an area (niche), that you are passionate about. If you love cats, choose that. If you like candles, choose that. So here you can expand and choose a few things or stay within a certain area – dogs, dog breeds, cocker spaniel. The idea, which makes total sense, is to find an item that people are going totally viral (crazy) over because you can bet that not everyone in the world has heard about every product – you’ll have a chance at showing your product to them – and, think, not “everyone” buys. They may watch the video or comment, but doesn’t mean they are buyers. You could be that second exposure to the product that takes them to the purchase. 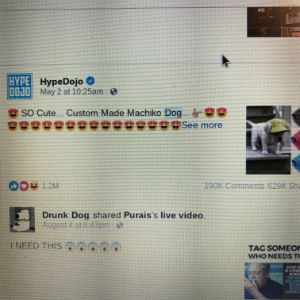 So once I put in “get yours” dog, I scrolled down the page and found this one product that had so many – what Facebook calls “engagements” – that I knew it was a real winner. 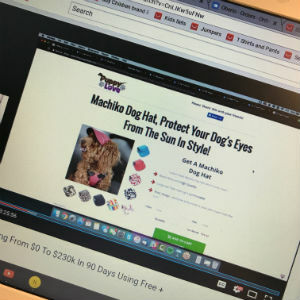 Here’s a screenshot of what I found; some dog hat. Who woulda thought? With 1.2 Million likes. That’s 1,200,000 people clicking on the Like link. So, I’m off to find out where I can source this Machiko Dog Hat. First, I want to check out their page and see how much they are selling this for. Now if I’ve lost you already, know that you can start up your own web store with zero knowledge for free for like 14 days with Shopify. I’m not an affiliate, but I use and love them. They have chat support and are always very helpful. When I click on the link which is hidden in my picture here by “See more”, I am taken to their web store which is a simple Shopify store with a handful of products. So what are they doing? Well, they are marketing one or two products online here and are not really a full-fledged store. And that’s fine. Nothing wrong with a dog hat only store in today’s economy. If they don’t ship to me, I call my card company. Come to find out – that is So rare because the merchant account people don’t put up with much and will cancel a fellows account if he just rakes in the money and doesn’t ship. These places are all legit for the most part and just want to sell you a nice product or service on the web. Here you see whomever created this post is selling this dog hat for almost $20. So my next item is to find a place to source these hats and ship them direct to the customer. This is a legit business model. Tomorrow, I have a online course with Cener. I am looking for a mentor in this area. So, yes, I’m jumping in feet first. I’ve study this and have even had great success in online stores. And can you source that puppy hat for less than $20? You bet ‘cha!! All day long.